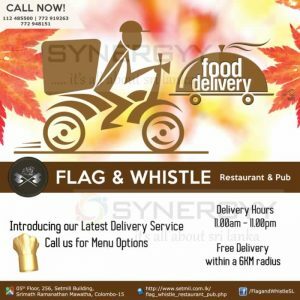 Flag & Whistle Restaurant & Pub a famous German Restaurant located at Setmill Building, Srimath Ramanathan Mawatha, Colombo 15 introduce the Free Food Delivery services within 6 Km radius. 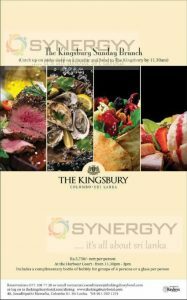 The delivery services are available from 11.00 Am to 11.00 Pm for the all latest delivery menu of Flag & Whistle Restaurant & Pub. Burger King introduces a new Sawan into their menu, this sawan called as king sawan and it’s sufficient for 4 people to tantalize their taste buds. 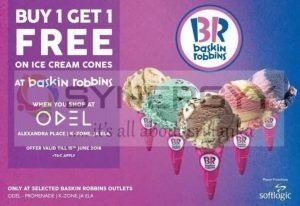 Baskin Robbins announces a special Buy 1 Get 1 Free Promo for ice cream cones when you shop at ODEL Alexandra Place, K-Zone, Ja Ela stores you could exercise this offer at Baskin Robbins outlet at ODEL Alexandra Place, K-Zone, Ja Ela. 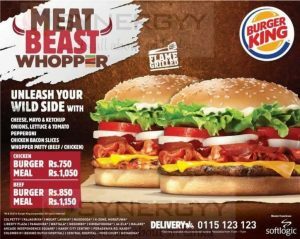 Burger King brought you Meat Beast Whopper Promotion for chicken and beef burger, just unleash your wild side with cheese, mayo & ketchup, onions, lettuce & tomato, pepperoni, chicken bacon slices, whopper patty (beef / chicken) as whole. 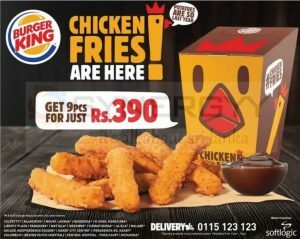 Burger King Sri Lanka introduces the delicious Burger King Chicken Fries now in Sri Lanka for an affordable price. The price starting from Rs. 390/- for Burger King Chicken Fries 9 Pcs. Visit nearest Burger King and enjoy the new verities of burgers and fries available at Burger King, for more details see below image or contact to 0115 123 123 for delivery. 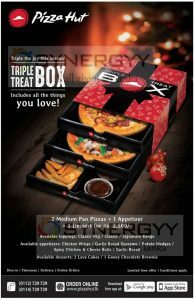 Pizza Sri Lanka brought you a Triple the joy this season with Triple Treat Box Includes all the things you love. Burger King a leading fast food restaurant announces a big price cut of more than 20% for Burger King Rice Selections. Burger Kings Royal Lunch was Rs. 280/- and now reduced to Rs. 250/- and Burger King BK Rice was Rs. 230/- and now reduced to Rs. 190/-. 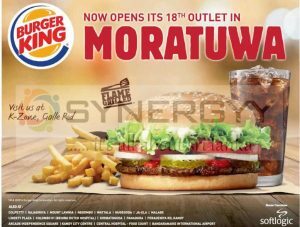 Burger King by Softlogic opens its 18th Outlet in K-Zone Moratuwa. Visit to K-Zone, Galle Road, Moratuwa and experience the flame grilled burgers only from Burger kings. 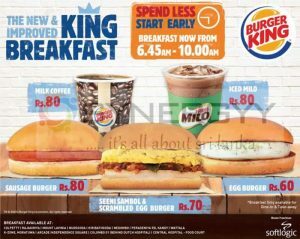 Burger King in Sri Lanka improve their breakfast menu and adjusted to lower the price and open early opening from 6.45 Am to 10.00 Am for a breakfast. Taste it before it’s too late! The delicious Mutton Kofta Sub, marinated in Arabic spices and paired with the new Garlic Aioli Sauce. 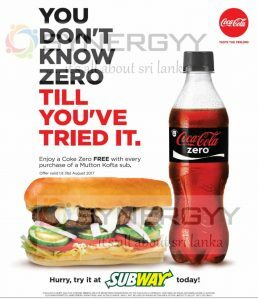 Don’t forget your FREE COKE ZERO to wash it down with. 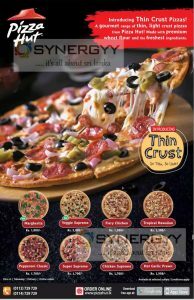 Pizza Hut Introduce Thin Crust Pizza, A gourmet range of thin, light crust pizzas from Pizza Hut! Made with premium wheat flour and the freshest ingredients. Pizza hut Introduce 8 different varieties of Thin Crust Pizzas now, its your time to enjoy Thin Crust Pizzas, see below table for prices. 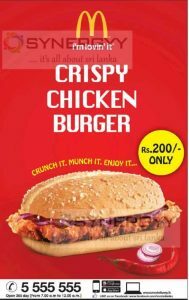 McDonalds Sri Lanka introduce a latest unit of Crispy Chicken Burger for just Rs. 200/-. Crispy Chicken Burger with a fine crispy chicken with spicy onion blends makes your taste buds wanted this crunch it and munch it more and more. Visit your nearest Mcdonalds outlet today and enjoy this special food or els now you can have Crispy Chicken Burger by home delivery or take away from Mcdolads from 7 Am to 12 Midnight. Domino’s Chicken Fillers is a hearty meal, three juicy boneless chicken grain with mozzarella cheese, tipped with jalapenos, red paprika, crispy peppers, drizzled with hot chipotle and a varety of sauces on wall seasoned flat bread just comes for Rs. 650/-. 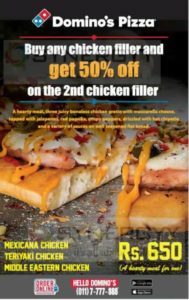 start taste the first Chicken Fillers and you will consume more than your what you think of, so Domino’s pizza offer a special discount of 50% off on your second Chicken Fillers. Presently Domino’s pizza offers 3 types of Chicken Fillers such as. 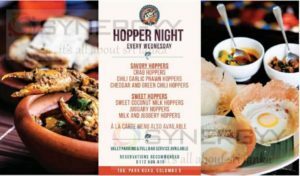 Off The Hook Restaurant and Bar located in Park Road, Colombo 05 announces that they declare every Wednesday Night as a Hopper Night. If you a lover of a hopper, here is an opportunity to taste every different varieties of hoppers. Australian based premium range of classic non-alcoholic mixers with natural ingredients and purified water to deliver superior taste now available in Sri lanka. Bickford and Sons has a grand history of crafting exuberant flavours and exquisite tastes. Over 140 years ago, and even after his passing, the recipes created in William Bickford’s apothecary shop inspired the creations of wife Ann Margaret’s South Australian Cordial factory. With the arrival of carbonation in 1874, the cordial factory became AM Bickford and Son, producing exhilarating beverages that quickly ensured that the Bickford’s name became synonymous with superior quality and taste. Today, the same commitment to authentic recipes and innovative production methods using only the finest ingredients lives on. To that we say Bravo! A jolly good innings indeed. Voted as one of Thailand’s best restaurants since 2007, the renowned fine-dining Nara Thai restaurant chain commenced operations in Sri Lanka yesterday by partnering with Everbright Holdings (Pvt.) Ltd.
Nara Thai combines the highest quality ingredients and age-old recipes to provide a truly authentic Thai experience. 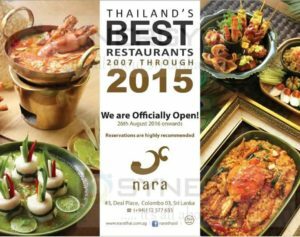 At Nara Thai Sri Lanka, guests can taste the best Thai upscale home cooking in the midst of a sleek and contemporary setting. 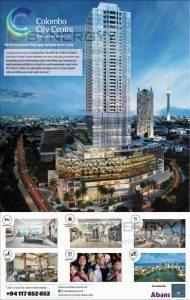 Everbright Holdings is renowned for specializing in the food and beverage industry in the country with a bevy of well-known global names under its belt. It is well known for bringing the Manhattan Fish Market to Sri Lanka. Its latest venture – Nara Thai Restaurant – is situated opposite the flagship Manhattan Fish Market situated down Duplication Road. Speaking at the media conference, Nara Thai Cuisine Co. Ltd Co-founder Yuki Srikarnchana said that she is proud to represent Thailand by bringing the best Thai taste and sharing the real authentic taste with people in Sri Lanka. “Since we began our journey in 2006, we have been expanding to our neighbouring countries in the region. We have expanded to Singapore and Vietnam as well recently,” she added. Nara Thai Sri Lanka Managing Director Shafraz Anees said that his company is proud to introduce Nara to the discerning food intellects of Sri Lanka. “Our team aims to serve our guests with the best service offering a delicious range of bold flavours and tastes that are bound to excite their senses. Nara is celebrated for its authentic Thai dishes in its delicious a la carte menu. Each dish derived from authentic recipes that have been adapted into a modern context intricately made. It is a restaurant where any person with a passion for Thai food can truly experience authentic Thai dishes,” he said. 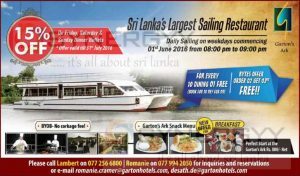 Garton’s Ark Sri Lanka largest Sailing Restaurant announces a special discount of 15% off on Friday, Saturday and Sunday dinner buffets till 31st July 2016. Enjoy your river cruise ride in late evening and enjoy delight buffet dinner with an exclusive discounted price till 31st July 2016. 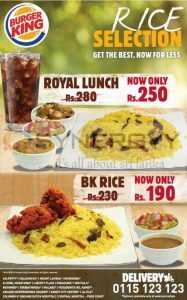 Are you aware Burger King Srilanka offer mouth watering Royal Lunch of Rice & Curry just for Rs. 220/-. 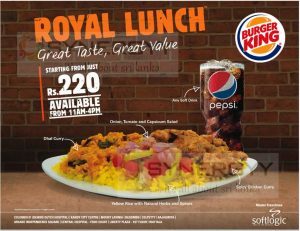 it’s a time to enjoy your full meal of Burger King Royal Lunch at any of Burger Kings outlet with Yellow Rice with Natural Herbs and Spices, Onion, Tomato and Capsicum Salad, Dhal Curry, Spicy Chicken Curry and any Soft drinks. 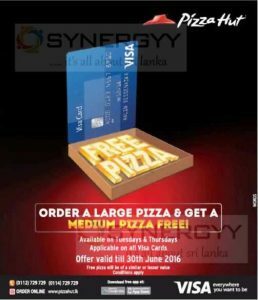 Pizza Hut announces special promotion of order a large pizza & gets a medium pizza free till 30th June 2016. The special promotions are available on Tuesdays & Thursdays Applicable on all Visa Cards.